Did you know that your leg wraps might be doing more harm than good? We spoke with Dr. Carrie Wheeler of Edelson Equine Associates in Manheim, PA to learn about the common mistakes people make when wrapping their horse’s legs. There is most definitely a right way and a wrong way to apply leg protection. The wrong way may cause permanent tendon damage and leg weakness. What does she mean by this? You could actually cause permanent damage by incorrectly applying your leg wraps. Let’s look closer. There are two common mistakes that people make when applying leg wraps. First, they don’t use enough cotton padding underneath the bandages. Dr.Wheeler explained that this padding would act as extra protection in case the bandage is bound too tightly or unevenly. The second mistake is that people often use a bandage that is made of overly stretchy material. “You actually really want a bandage more like the old school flannel that people used to use that isn’t really stretchy.” This non-stretchy material can be a bit trickier to apply without wrinkles so it may take some practice. “No-bow” bandages are also an option. Why are stretchy bandages such a problem? Glad you asked! If you pull a stretchy bandage too tightly during wrapping it will constrict around the horse’s leg and act like a tourniquet. During transport, this will irritate the tendon and trigger swelling in the horse’s leg. More swelling means an even tighter wrap and the problem compounds itself. Over time, this can cause some serious damage to your horse’s leg. The amount of damage depends on the length of time that the horse is wearing the improperly wrapped bandage. If you’re lucky, a short trip won’t cause enough irritation to damage the ligament fibers. For longer trips or more severe cases, the ligament fibers can suffer long-term damage requiring several months of rehabilitation and repair. “Unfortunately they don’t always repair completely. There is often scar tissue involved and then you’re looking at an area with a permanent weakness for the rest of that horse’s career.” A veterinary examination and ultrasound will be required to know the full extent of your horse’s injuries. In order to properly apply a leg wrap, Dr. Wheeler really suggests you have an experienced horse person physically show you how to wrap a few times. Practice the technique and make sure your horse is comfortable with the new wraps before attempting to take them on any trailer trips. If an in-person tutor is not available, these guidelines may help. Dr. Wheeler said, “The biggest thing when putting the bandages on is to make sure you have a thick padding underneath and making sure the wraps are the right size.” Apply the cotton padding firmly and avoid any wrinkles. RIGHT: It is important to use sufficient padding under the bandage and wrap with even tension up and down the leg. Photo Credit. Once finished, you can flick your fingers on the wrap and listen for a solid sound on all parts of the bandage. If you hear a mushy sound anywhere, it’s an indication that the wrap is not applied evenly and should be redone. Bell boots may be put on before wrapping to help protect the coronary band area. If you are not confident in your wrapping skills, you may want to consider pre-made shipping boots with Velcro straps. The main disadvantage with shipping boots is that they lack the support of leg wraps. 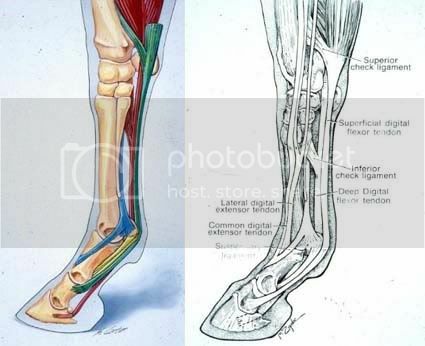 Dr. Wheeler also cautioned, “The problem with those is that they are made to preset sizes, so you need to be careful to get a size that will conform to your horse’s legs.” For example, a pair of pony shipping boots won’t be appropriate for a tall Thoroughbred. Make sure they fit snuggly so they don’t slide or slip off while the horse is on the trailer. LEFT: Shipping boots can be a safer option for novice horseman. Just be sure that they fit your horse properly. These boots are available from DoverSaddlery.com. Some pairs of shipping boots on the market will extend up past the horse’s knees and hocks. We asked Dr. Wheeler if these were really necessary. She said, “Sometimes it’s nice to have a pair that go up a little bit higher to cover those extra areas.” It really depends on your horse and how much they move around in the trailer. Just be sure to check your horse during longer trips to see how they are doing. Boney knees and hocks can sometimes rub against these taller shipping boots resulting in painful abrasions. “The key is that it’s appropriately sized for your horses, and sometimes that can be challenging.” They should cover all the way down to the back of their heel, but not be too long that they drag down on the ground. Using leg protection is especially important if you are transporting your horse with other horses that can kick them during travel. If your horse is traveling alone, then leg protection is not quite as important. There are times when you would be better off leaving the leg protection at home. We already explained that leg wraps could cause serious damage if incorrectly applied. You also shouldn’t use shipping boots that are not the correct size for your horse as they may cause rubs or slip out of place. Finally, you should take your horse’s comfort level into account. Horses that are not trailered often can become nervous when wraps are applied. “Sometimes you might be better off to just leave the horse bare until you have time to practice or get the horse used to wearing these.” Also, make sure you allow your horse time to adjust to new trailers. Many horses can become skittish if you suddenly switch from a small bumper pull horse trailer to a spacious 3 horse slant load trailer with living quarters in the front. Use leg wraps with enough padding, a non-stretchy bandage, and proper application. If you aren’t comfortable with leg wraps, find a shipping boot that is properly fitted to your size horse. Most importantly, make sure your horse is comfortable wearing the leg protection on the trailer. This can be assured through proper training and regular exposure. Happy travels! We asked fellow horsemen what they do for leg protection in the trailer. Here are their responses. Shannon from Ohio: "I don't use wraps. I use shipping boots. Waaaaay easier, without any possibility of tendon bowing." Natasha from Pennsylvania: "I actually don't use anything for short trips anymore... I don't like wraps, I'm never confident enough that I won't cause a bowed tendon. I don't feel like shipping boots are worth it for a short haul." Sherry from Pennsylvania: "I just use professional choice boots." Thanks for your input! What do you use for leg protection? Comment below!